LAWRENCE, Sporting Alert – No. 2 Kansas and No. 3 Oklahoma will meet at Allen Fieldhouse in Lawrence, in what is expected to be a thrilling college basketball Big 12 clash on Monday night. Live ESPN3/WatchESPN Streaming listings. 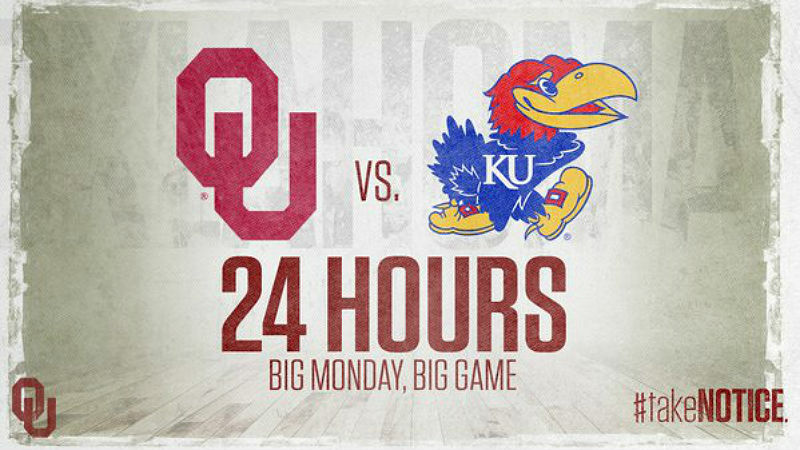 The Journey To The Tourney BIG 12 battle will tip-off at 9:00 p.m. ET, live on ESPN and the Jayhawks (12-1) start as the 6-point favorites with the game’s total sitting at 156. We have seen some thrilling battles this year already, but this matchup is on schedule to be the college basketball game of the year at this moment. The Sooners (12-0) remains undefeated this season and are coming off a pressing 87-83 victory over No. 11 Iowa State on Saturday. Oklahoma, which has knocked off two ranked teams already this year, is averaging 87 points per game and allowing 67.5. Overall, as a team, the Sooners are shooting 48.1 percent from the field. Leading scorer Buddy Hield, who is averaging 24.7 points per game, is ranked fourth in that listing, while shooting 49.5 percent from the field and averaging 5.3 rebounds per battles. Hield has also scored 30 or more points four times season and he will be a big threat to the Jayhawks on their own turf. Kansas, in the meanwhile, enters this battle shooting 51.6 percent as a team, which is ranked fifth overall in the nation after their 13 games. The men from Lawrence are also one of the best teams on offense — scoring 88.3 points per game, third best in the country, while allowing 65 points per contest on defense. These Jayhawks have a very balanced offense, which is centered around the likes of Wayne Selden Jr., Perry Ellis, Frank Mason III and Devonte’ Graham. In their last outing, Kansas route No. 23 Baylor 102-74 on Saturday in their Big 12 opener. Selden Jr. and Ellis were very good in this contest and they are expected to run the floor again on Monday night. Elsewhere on Monday, before the Kansas v Oklahoma clash, No. 7 North Carolina will take on Florida State live on ESPN at 7:00 p.m. at Donald L. Tucker Center in Tallahassee, while No. 5 Virginia take on Virginia Tech, live on ESPN2.